Jon Uzonyi told me tonight that he still has his old 50 watt Marshall heads. He was quick to add that he doesn't use them anymore 'cause they're just too loud. "But I just can't bring myself to sell 'em." That sentiment pretty well encapsulates what remains of the dreams of many talented musicians that didn't happen to write "hit" songs. It also confirmed that my first impression of Jon was correct- that he was driven; the vapour of his conviction as evidenced on Peacepipe's Accent 45 was simply too strong to have evaporated from him completely. Initially, it was my hope that he had continued to record for a year or two beyond the single and might have a few demos laying around Of course, tracking him down in 1994 resulted in one of the great Rockadelic albums (Peacepipe: The Human Equation Featuring Jon Uzonyi, RRLP 18, 1995) when it was discovered that an entire album had been painstakingly assembled with legendary engineer Eirik Wangberg and was lurking in the dark recesses of his doset This recording was made with Jon's old friends Gary Tsuruda (drums) and Rick Abts (keyboards), who were the other two-thirds of Peacepipe, a trio that often used the less-druggy name Human Equation when they played live shows. 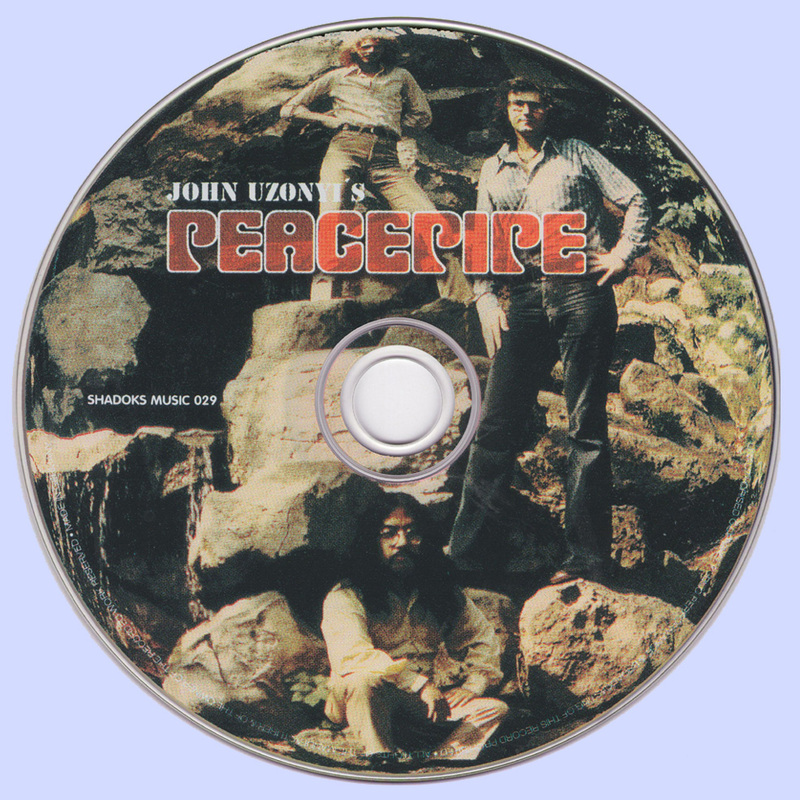 This is the first ever release of the Peacepipe album on compact disc, taken from the original master tapes via 24-bit digital technology. 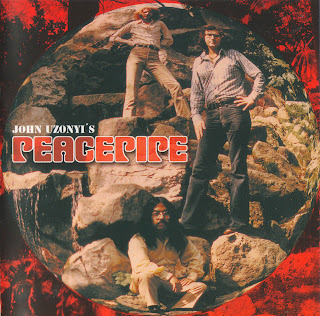 There's a ton of great rock from California's underground scene. . that's a given But if you're after serious guitar pyrotechnics, you'll be hard-pressed to top this CD The hideously rare Peacepipe single (by far the best record released on Accent) is one of the most utterly possessed recordings of the late 60's Both tracks have a unique dark energy to them that is not easy to describe with words- but they are indisputably lysergic Jon is quite certain that the small pressing was distributed by label owner Scott Seeley via promotional channels and none were ever offered for sale in stores. To my knowledge, this 45 is still virtually unknown amongst collectors and has never been camped. Incidentally, Rick does not appear on these tracks, it's only Gary on drums and Jon on everything else! After gigging around Southern California and Arizona for a couple of years, the band split amicably to pursue non-musical careers Jon continued to experiment with both music and electronics (you may have noticed in the photos that his various electric guitars are all odd hybrids that he pieced together himself!) and eventually the bug to record had infected him again. "Actually, I think it was more about a need to close that chapter of my life. The three of us had invested a lot of time and energy in that band, and had made great strides artistically. I felt compelled to capture at least some essence of that for posterity, even if nobody else would ever hear it." He rang up Gary and Rick and the trio converged at Sound Recorders in Hollywood. This recording was more about Uzonyi's opportunity to create a comprehensive document about Peacepipe, though- and it is his fiery, inventive guitars in their dense layers that render awe today. The trademark creepy Peacepipe sound is evident especially on Sea Of Nightmares (". if dreams of happiness lose their way, you die of sadness in the grave... I know that feeling...") and The Day The War Has Ended, an elaborate and stunning reprise of the A-side of the Accent 45. It is here that those artistic improvements really come into focus. There is softer material as well, some of which is excellent, but it's the overtly psychedelic hard rock in their repertoire that the band will be remembered for. Jon is still active in rural Southern California's music scene as a musician, sound engineer and audio technician He still builds guitars and amplifiers, and our conversations usually wind up over his workbench where be describes his deconstruction of an old Fender blackface amplifier for its parts or his discovery of a lost cache of American made power tubes He's still motivated by music. He tells me he really doesn't have the opportunity to play heavy rock anymore, but we both know that if that door opened, he'd dart right through it carrying an arsenal of fuzzboxes and wah-wah pedals... and he'd bring those old Marshalls with him. fantastic update to my own vinyl rip!! many thanks, Marios. Can you re-up my friend,the link is crazy dead.Thanks again.